Kiyomi Lim's Site. : Thank you very much. I have officially hit 1.2k 'like's on my personal blog page on facebook. I am very very happy! I have to thank Fashion Hooks, Cynthia, and Ee Eng. Ee Eng helped me to gain more readers by promoting my page to her 1k friends on facebook. Cynthia helped me promote my blog and page on her own personal blog page and encouraged me to do giveaways. I also have to thank those people who used their hearts to know who I am by reading my blog without knowing who I am in the first place, and stayed on here to support me by reading my blog. She said that she knows that she isn't pretty and asked people not to be so mean to comment on other people's sizes or looks when you can obviously tell that they are trying very hard to work on it. She named the post, Superficial Appeal. I would like to say that, I was like her too. Many people insult me, some called me "roti prata face" some said that I look really disgusting and that I have weird features and so on. When I joined the online world, online people started saying that I am fat because I look really fat in pictures. *I admit that I'm not slim, but at least, I am not fat. Looks is important, I know, thats why I improve myself. I used to be someone who's always jealous, drinking vinegar all the time, untill I finally asked myself. Why? What for sitting here, making myself so miserable, but yet doing nothing about it. So today, this blog post truely means "How to make people JEALOUS of you". * I feel like I'm writing a book, LOL. Chapter 1, chapter 2, chapter 3.. Ok, just kidding, gonna summarise stuffs. 1st of all, SELF CONFIDENCE. -Tell yourself, you are who you are, you don't have to please anyone except for yourself. Tell yourself, no matter how you look like, you still have yourself. 2nd, FLAUNT WHAT YOU HAVE. -Flaunt your looks, flaunt your hair, flaunt anything that YOU think is better than anyone else. Hide what's bad of course! 3rd, BE PROUD TO BE JEALOUS. -Don't keep the jealousy, flaunt it, speak it out, love it. BUT don't change yourself for it. -Do what you like, speak what you like. Be it online, be it in real life. Just SPEAK UP. -Your hardwork can make people jealous, your perserverance can make people DIE. Your end results of your hardwork will make others JEALOUS. I believe, with these 5 tips, anyone can make others jealous. Like myself, I know I have many many things that I feel inferior about, but so what? I am myself and I know that I can survive like that, I continue to improve. People are jealous. They are not jealous of my looks I believe, since I'm not pretty, they're jealous of my other factors! So what if YOU and ME don't have the looks, we still have eyes, mouth and hands. We can improve, speak and use eye contact to make people jealous. Truely JEALOUS people don't speak of what they are JEALOUS about. or even the girl who you're jealous of, FLAUNT your character and IMPROVE yourself. Others, even if it's not the girl you're jealous of, WILL be JEALOUS of you. So what are there to do afraid of ! I hope you all find this post useful ! ^^ See yah ! 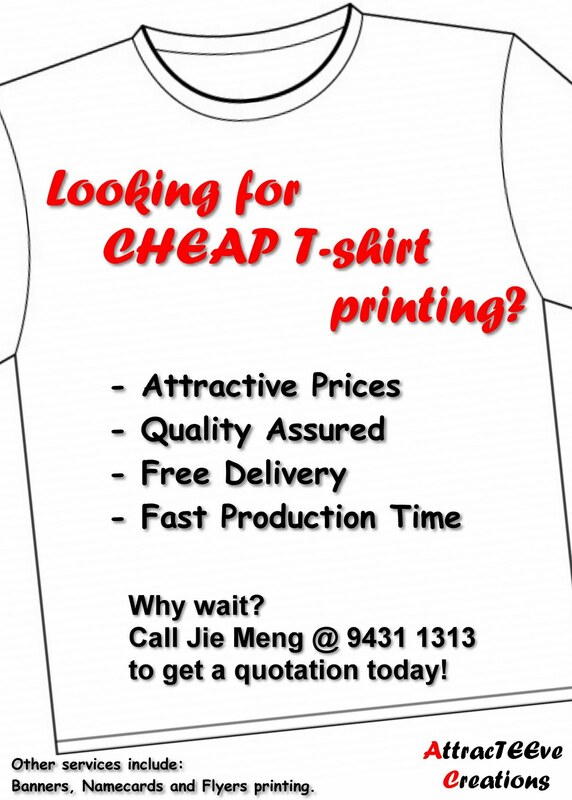 Do you wanna print T-Shirts for your school's CCA or events? Or do you need to print some blogger's or business cards? Or do you need to print flyers/banners for your blogshop/events? Quality assured and low prices are waiting for you here with AttracTEEve Creations! Sms JIE MENG today at 9431 1313 today if you need these items! I swear they work really well with close deadlines and produce really quality works! 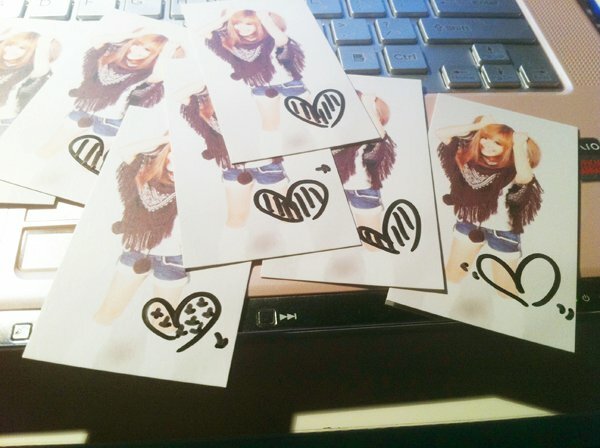 I printed my Blogger's Card with them! So if you're a blogger/blogshop owner, why not just look for them! Love u kiyomi! I agree with what u wrote here.